The ultimate power tool from KTM. KTM designers pulled out all the stops in the art of engine building when it came to the 1190 RC8 R. The rider has one of the most powerful V2 engines of our times and one of the best chassis in the world at his or her disposal - totally street-legal. With the precision to cut out the others when entering the corner. With the power and traction to pull away from them exiting the corner. 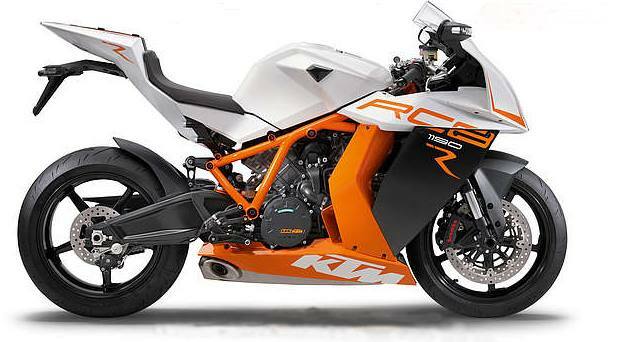 With the feedback and ergonomics to enjoy the 1190 RC8 R to the full. Brakes: The RC8 R's brake system with the highest quality Brembo® components functions perfectly, sensitively and steadily. At the front, for example, two radially-mounted, four-piston brake callipers and two 320 mm diameter and 5 mm thick semi-floating brake discs provide massive stopping power. Frame: The KTM RC8 R's thin-walled, 7.3 kg light tubular lattice frame of high-strength chrome-molybdenum steel sets standards in dimensional stability and lightweight construction. Its optimal stiffness distribution results in fantastic precision and unparalleled stability. Swingarm: The intricately made light alloy swingarm makes a significant contribution to the outstanding traction of the KTM RC8 R. The position of the swingarm can be adjusted by means of an eccentric on the lever linkage. In this way, compression can be minimised and squatting prevented when accelerating out of corners. Centralisation of Masses: The RC8 R not only impresses with low weight and perfect chassis geometry; the centralisation of masses - for example, by positioning the silencer under the engine - also contributes to its easy handling and razor-sharp precision. 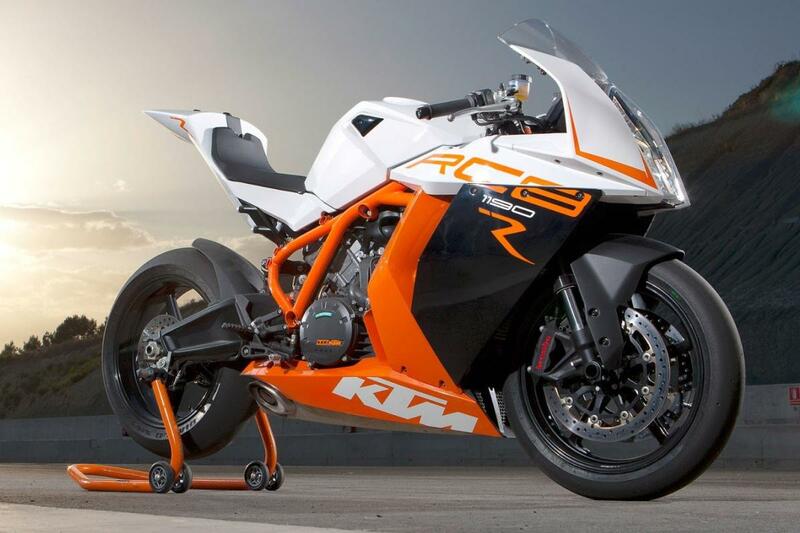 Wheels and Tires: The lightweight, Marchesini, aluminium die-cast wheels on the KTM RC8 R are fitted with Continental Sport Attack II tires. These top-quality tires provide outstanding ride characteristics and endless grip, whether on a wet country road or a scorching hot racetrack. With a decent service life, they support the unique qualities of the KTM chassis at all times. Linkage: The progressiveness of the linkage provides the shock absorber with refined responsiveness and still with sufficient reserves at peak loads. The position of the swingarm can be adjusted to the rider's riding style and weight by the easily accessible eccentric adjuster on the linkage, and squatting on acceleration can be prevented. Telescopic Fork: The high-quality upside-down fork from WP Suspension can be adjusted separately to preload as well as to compression and rebound damping of the suspension. Their adjustment ranges extend from country road comfort to tough racing conditions. In addition, a WP steering damper keeps the forks on track, even under extreme conditions. Setting Options: The KTM RC8 R not only offers extraordinarily relaxed ergonomics for all its supreme sportiness, but also more ergonomic setting options than any other series production superbike. Footrests: two heights, each with two positional variants. Foot levers: variable lever operating angle and lever length. Seat: two heights. Hand levers: variable. Handlebar: two heights and two angles. Shock Absorber: The sophisticated internal mechanism of the WP shock absorber on the RC8 R completely isolates the rebound damping from the compression stage, so that they can each be adjusted independently from one another. The compression damping can also be set for high speed and low speed. The suspension set-up range extends comfortably to racing conditions. Engine: With its 129 kW (173 hp) of power, the V2 on the KTM RC8 R can be considered as the measure of all things for ultra-sporty twins, with maximum performance, predictable characteristics and high reliability. The KTM engine impresses with an extremely broad rev range and spontaneous throttle response, while supplying supreme ride quality. Twin Plug Ignition: The twin plug ignition system on the latest RC8 R fires the two differently sized spark plugs in each cylinder head independently of each other in such a way that more efficient combustion and a smoother, optimally controlled combustion sequence are achieved everytime. The result: even more and even better controlled power, lower fuel consumption, and less emissions. Injection/Engine Management: The electronic Keihin engine management system with twin throttle valves regulates the modern electronic fuel injection system on the KTM RC8 R, focussing on maximum power with predictable power development and spontaneous responsiveness with precisely controllable throttle response. Piston: The forged piston structure on the RC8 R, borrowed from Formula 1, results in a high loading capacity, despite the extremely short and lightweight design. This minimises the reciprocating weight and optimises the responsiveness and free-revving nature of the engine. Cylinder Head: The main reasons for the outstanding performance of the RC8 R V-twin with 75° cylinder angle are the state-of-the-art cylinder heads with twin plug ignition, flow-optimised ducts and cam follower drive for the valves (intake: titanium; exhaust: steel). For tuners: Valve timing is adjustable via the camshaft gears. Crankshaft: The smooth shape of the crank webs on the latest KTM RC8 R results in low-loss running of the crank drive; the modified weight distribution of the crankshaft and a newly dimensioned alternator rotor improve the smooth running of the engine. Together they optimise the load change behaviour of the engine.